Ibiza is one of Spain’s Balearic Islands, which include the main islands of Mallorca, Menorca and Formentera. It lies approximately 186 kilometers off the coast of Valencia and can be reached by many international flights, or by ferry from the mainland. Read our list of top picks for things to do and see on the island, from partying to laid-back beaches. Ibiza is of course known for its lively nightlife and party scene, and is home to some of the most famous night clubs in the world. The city of Sant Antoni de Portmany is the island’s second largest and sits on its west coast. Some of the more renowned clubs here include Amnesia, Es Paradis, Ocean Beach and Eden Ibiza. Make sure to take a walk down the celebrated Sunset Strip, dotted with bars along the waterfront. Ibiza may not seem like a classic diving destination, however its waters are actually home to a wide variety of marine life. Qualified divers and those who want to learn should head to the Scuba Ibiza Diving Centre in Marina Botafoch in Ibiza Town’s harbor. Ibiza may be the party island, but it’s also home to many paradisiacal beaches and idyllic coves. To party with the celebrities, head to the white crescent of glitzy Las Salinas in Playa d’en Bossa, located on the south of the island. Backed by pine forests, it’s filled with the sounds of DJ beats. If you’re looking for something more relaxed and family friendly, try Cala Jondal in San José, a mix of sand and pebbles with beautifully clear waters. And if it’s views you’re after, make your way to Cala d’Hort near Cala Vadella, offering spectacular views of Es Vedrà rock. Dalt Vila, also known as Ibiza Town, is one Ibiza’s most picturesque cities, which is home to an old port and historic city ramparts, which were built in the 16th century to keep out the Turks. The fortified Upper Town (Alta Vila) is a leading example of Renaissance military architecture and has been declared a UNESCO World Heritage Site. Ibiza’s little sister is a world apart from the packed resorts and party towns, and it lies just six kilometers away. Home to Caribbean-style beaches, small coves and inlets, and charming villages, it’s definitely worth exploring, even if just for the day. Ibiza doesn’t only enjoy a reputation as a party island, but also as a laid-back, hippie island. If you want to experience the real hippie side of it, head to Benirrás Beach, located near Port de San Miguel, on a Sunday night for the famous sunset drumming party. 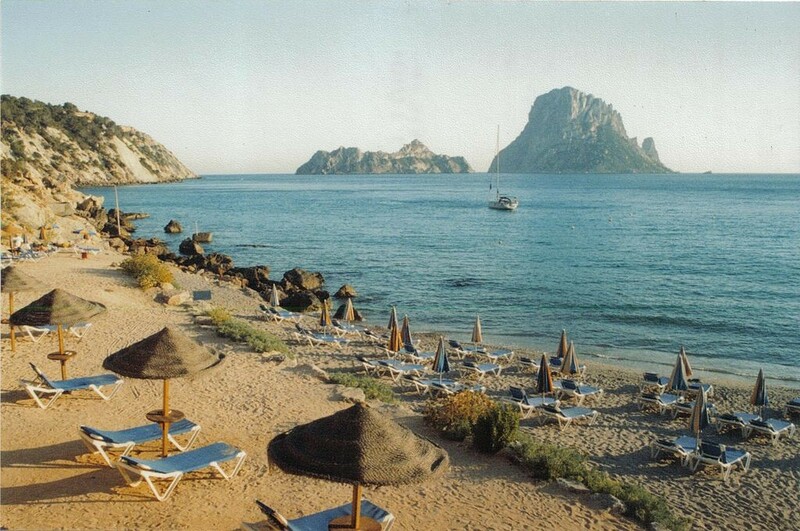 Visit the area of Cala d’Hort and you’ll see the celebrated Es Vedrà rock formation rising dramatically from the sea. Part of a protected nature reserve, it measures around 400 meters in height and makes for quite a sight. On the east coast of the island, just outside the town of Es Caná, you’ll find one of Ibiza’s biggest and best hippie markets – Punta Arabí. You’ll find everything here, from beaded jewellery to tie-dye clothes, handbags and small trinkets.